Welcome to the all-new, all-different Manga Monday. As before, the goal of this collection of articles is to introduce readers to a variety of manga series. What makes it all-new and all-different is the change in focus. Rather than summarize and hype a series (which I cannot help but do), elements of the series will be pulled out for discussion and exploration. As such, some of the series previously covered will be explored more in depth (I’m looking at you, Fullmetal Alchemist) with some series getting multiple weeks. If you walk away from these articles learning about more than just a manga series, then I have done my job. A Silent Voice, or Koe no Katachi, is written by Yoshitoki Oima. The series is completed, with seven volumes released in Japan by Kodansha (the sixth volume was released in America on April 19, 2016). Crunchyroll manga has all chapters available on their platform for their subscribers. It recently received a nomination for an Eisner Award in the category of Best US Edition of International Material – Asia. A nomination signifies excellence in storytelling with a graphic medium. A Silent Voice excels at tackling the difficult issue of bullying with grace and compassion. There are two main characters, Shoyo Ishida and Shoko Nishimiya. The story starts out with the two in elementary school, where Ishida is the class troublemaker and Nishimiya is a new transfer student. Ishida is losing a fight against boredom when his friends are starting to see his antics as dangerous and pointless. Nishimiya is his answer to escape. Usually, in a manga series (particularly shojo), this is where the main boy and main girl start to develop a meaningful relationship. Not so here. 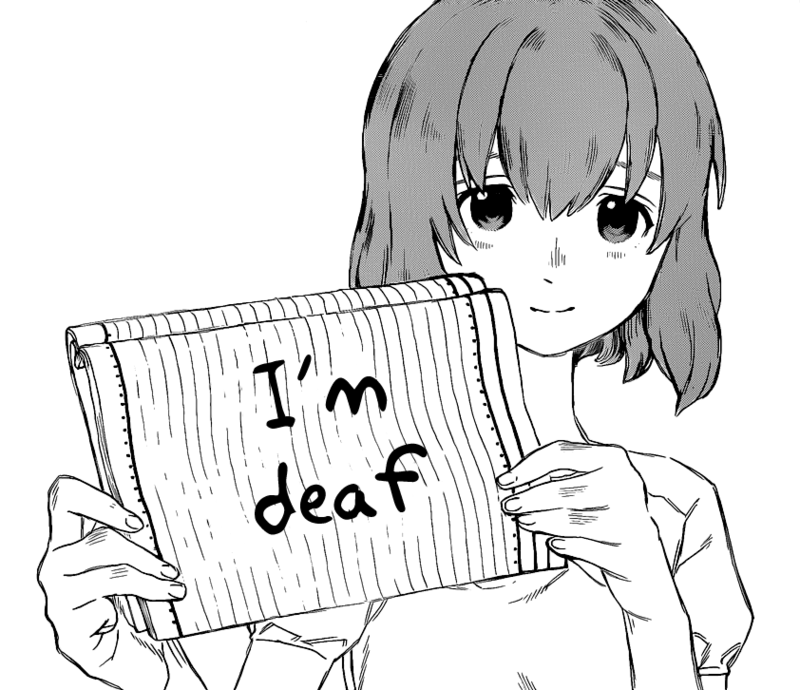 Nishimiya is deaf, and she struggles to make friends in her new class. She requires extra help from those around her to understand the lessons in class and tends to slow down the pace of the lessons. Ishida begins to bully Nishimiya in extremely hurtful ways, from yelling at her from behind to destroying her hearing aides. Besides the incredible dramatic story happening throughout the seven volumes, the series describes how bullying and being bullied can destroy a person’s life. 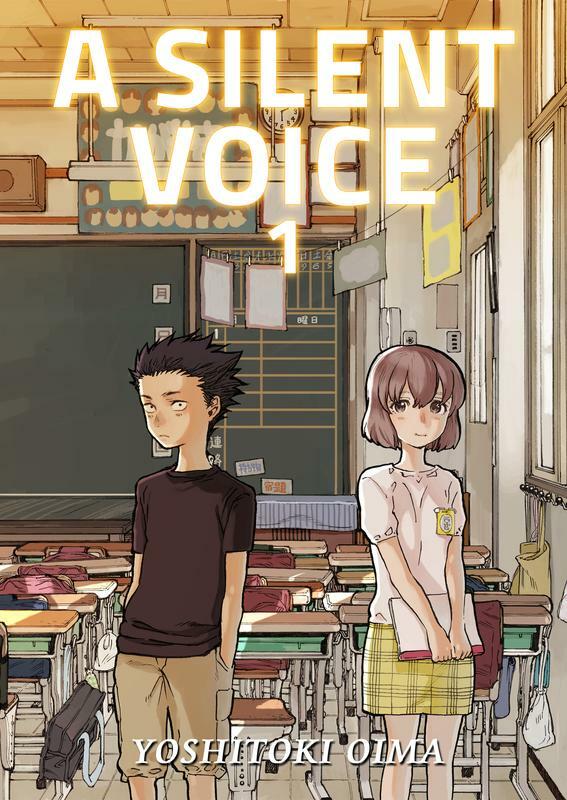 Bullying is a serious problem, and A Silent Voice does an incredible job showing just how far reaching bullying can be. Ishida, who relentlessly bullies Nishimiya in elementary school, is eventually shunned by his classmates and his teachers. These are the same people who laughed at Nishimiya or participated in the bullying along with Ishida. When someone has to publically take the fall, Ishida seems the natural choice. Nishimiya could not make friends in elementary school, and Ishida eventually lost all of his. She transfers to another school, exiting Ishida’s life for years. Fast forward to senior year of high school. Ishida has endured years of bullying from others, primarily in the form of isolation. After being ousted as a bully, the others in the class refuse to include him. They emphasize his cruelty while erasing their compliance with his actions. The bystander effect takes place, where those who are watching the bullying feel more as part of their group than the bully and the victim (Rivers & Noret, 2010). Ishida, once the bully, is the bully-turned-victim. Bullies-turned-victims occupy a unique place in the relationship. They represent a fall from grace (or importance). For students who thrive off of the attention of peers, the transition from being a bully to being a victim can be particularly devastating. In Ishida’s case, he has to deal with the damage he inflicted on Nishimiya years ago while being in isolation from his peers. A Silent Voice handles another topic with delicacy – suicide. Students who are bullies-turned-victims have a higher rate of suicidal ideation (Rivers & Noret, 2010), and Ishida is no exception. Ishida prepares for his suicide by paying his mother back (she had to cover the cost of Nishimiya’s eight damaged hearing aides), severing ties with his job, and apologizing to Nishimiya. Nishimiya is the crux of Ishida’s pain, and he recognizes that his hurt comes from the guilt he has felt after all these years. Nishimiya is still the victim. She endured severe bullying in elementary school, including physical pain, because of Ishida. Despite the hurt, she readily forgives him; however, she carries the damage of the bullying as well. Now almost an adult, Nishimiya has developed ways to cope with the bullying and a support network of caring people, including her family. As the series progresses, we learn that Nishimiya is far more complex than she lets on. Students who endure severe bullying are more likely to be depressed, and verbal bullying is more likely to be associated with suicide risk than other types of bullying (Kodish et al., 2016). Depressed adolescents can have impaired social and emotional control, which impacts our two main leads. Oima has written this series carefully (each chapter opens with her name followed by “Under the Supervision of the Japanese Federation of the Deaf). The impact of bullying is layered, and the symptoms do not reveal themselves all at once. It is only after reading the series can the reader see just how pervasive and toxic childhood bullying can be to adolescents – even for those who were uninvolved. Oima has crafted a story that truly captures the nuances of violence against others. There are very few bombastic monologues and confessions; rather, the emotional narrative is slowly unrolled before you. Characters are not one-dimensional, even the background characters. In seven volumes, Oima has presented a lasting narrative regarding the importance of taking time to understand others’ voices.